“Hannibal”, created by Bryan Fuller, premiered last Thursday and I’ll admit I was interested in this show from the very beginning, because I am a sucker for murder mysteries and because forensic psychology is a degree I am currently seeking. So when I read that they were going to make a show in which the audience would witness Lecter prior to him being caught, I was all in. For those of you who didn’t catch the show, or have no idea what it is I am talking about, “Hannibal” depicts the early relationship between Will Graham (Hugh Dancy) and Hannibal Lecter (Mads Mikkelsen) as Lecter assists Graham in uncovering the motives behind serial killers, thus leading to their capture. Jack Crawford (Laurence Fishburne) reached out to Lecter because he saw the toll that this type of work was having on Graham and wanted to keep Graham on the investigation. The show begins with a depiction into Graham’s abilities which are shown as a yellow light waving across his field of vision thus allowing him to become the serial killer. Clearly, this type of work would take a toll upon anyone so it isn’t hard to believe that he would begin to work with Lecter so closely. The audience also gets a glimpse as to how Graham’s ability affects his personality and his social life, an aspect that I believe I did not see in “Red Dragon”, the book and movie that this series is loosely based off of. Where Graham appeared stoic and intelligent in the movie, Graham in the series appears nearly autistic and out of his element. I’m not saying that this is bad, I’m just saying that it is different and worth noting. So before I get into my spoiler riddled review, let me leave you with this. This show is good, it’s too early to tell if it is great, but it is good. Dancy does a wonderful job becoming this semi-autistic investigator, displaying all of the mannerisms that I have seen in many autistic individuals. Mikkelsen does a great job as well, displaying Lecter’s cunning superbly with these slight smiles and manipulative apologies. I think he will do Lecter justice. The verdict is out on Fishburne’s performance, at least for me. I can’t say whether I liked him or hated him. He just seemed to exist without bringing a lot to the table. That may be an indication of something in it of itself. 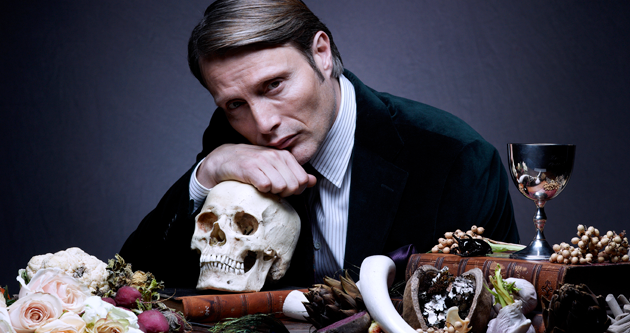 So, if you like dark murder investigation-esque shows, then check out “Hannibal”. It packs a great punch and left me yearning for another episode. Now onto the spoilers! Beware! The biggest problem that I had with this episode was the presence of Lecter at the trailer and at the house. I completely get that he is supposed to help Graham psychologically, but is he also supposed to help him with his investigation? I guess, but I wasn’t the happiest with this idea. Call me nit-picky, but Lecter isn’t an F.B.I. agent. He was never given a gun nor should he be accompanying an F.B.I. agents to areas of interest. He is Graham’s psychologist and he could provide insight into some of these cases by looking at the crime scene photographs and issuing a verdict, but he shouldn’t be there, because he would just be a burden. He doesn’t have a gun or a badge, so he wouldn’t be able to assist Graham in arresting a suspect. If he was given a gun and a badge and made an F.B.I. agent, I would have an even harder time with this show. Lecter’s place is in the office, not the field. He is supposed to help Graham psychologically not with the arrest of a suspect. I did very much like the dream sequences and I hope they continue being just as ambiguous and strange. I myself suffer from some unusual dreams and it bothers me, in some television shows and movies, when individuals have dreams that make complete logical. Graham’s dreams are anything but that. They are dark, bloody, and very very unusual. I also liked how Dancy depicted Graham’s struggles with the darkness. These episodes that he had appeared to physically drain him and I could see that on Graham’s face and within his eyes. This work takes a toll upon him and Dancy displays this wonderfully. Those, I thought, were the strong points and the low points of this show. What did you think? Where do you think this season is headed? Also, spoiler, Eddie Izzard may appear on the show as a serial killer! I’m a huge Eddie Izzard fan, actually met him once, and would love to see him in this role.